>>> drive near the tiny town of rhinebeck, new york, and you may hear the sound of wedding bells in the distance or maybe the sound of cash registers. and card machines saying, cha-ching. either way you look at it, a wedding priced at $3 million is a day away for chelsea clinton . courtney hazlett is live outside the beone of the most historic hotels in the country. >> it is actually going to be the hotel where most of the vip guests are going to be staying because reporters, we didn't find out about this until, really, a week ago. we're all staying far, far out of town for the most part. i spoke to some folks who stayed here last night, they're not going to the wedding but it was amusing to think that their hotel room would be sleeped in by a vip possibly as early as tonight. it's not typical to see a state trooper on every single corner right here. the local merchants are glad for the foot traffic. it's a big deal here and something that everyone is really embracing, which is what i think is so fantastic. no one i encountered said, i can't wait for all of this to be over. really a fantastic opportunity for the town of rhinebeck and they're excited to have this event happen. >> an economic gold rush for all those stores there. >> give us an estimate of what this wedding is allegedly going to cost. >> the estimates for this wedding begin at about $3 million for the total costs . there is talk that it is wildly inflated, but in talking to some folks here who have been privy to some of the wedding planning, they say it's the scale of what's happening that's so expensive. it's not just flowers being brought frin the wedding , flowers from some of the most specialized florists in the world, not exactly a corner store here in town. the tent for the wedding is not what you put up in your backyard. it's a tent that is actually a structure with glass, reportedly. a full air conditioning system, real floors for dancing. so, you can tell, it's extremely detailed planning here and the scale is going to be just phenomenal. >> the thing that caught me, they spent 15 grand on real porcelain port-o-potties for the guest. that's what i was reading. >> you know, you want your guests to be happy, right? >> that will do it for you, absolutely. courtney hazlett, thank you. >> if you're wearing a dress that costs $20,000, you kind of don't want to go into any old port-o-potty. >> thanks for the latest entertainment news logon to scoop.todayshow.com. learn all about the daily scoop right there. 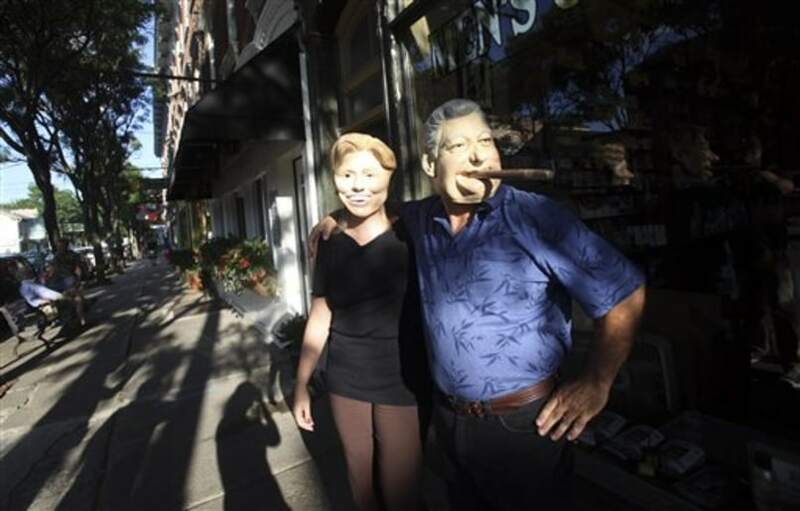 Residents Gary Kiernan, right, and Laurie Bathrick, wear Bill and Hillary Clinton masks while walking in downtown Rhinebeck in upstate New York.